There is no substitute for real turquoise or pure turquoise. There are plenty of imposters on the market that claim to be real turquoise, and these knockoffs are created so beautifully that they do appear as if they are the real deal. However, there are some important characteristics of real turquoise you should know about before looking to buy one of nature’s most precious and vibrant stones. It is vitally important not to be caught off guard when searching for for real turquoise. Here, you will learn all you need to know about spotting real turquoise and how to detect imposters. There is plenty of real turquoise out on the open market, but stones and gems that are known as “substitute turquoise” are also being mixed in with the real thing. 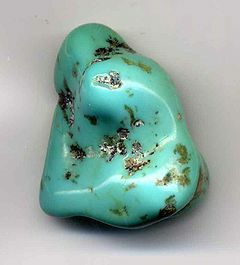 Howlite is most commonly used as a substitute for real turquoise. Because of the stone’s appearance, everyone from novices to avid collectors can potentially be fooled. Howlite is naturally white or grey, but the stone is dyed with blue or green coloring to present the mistaken appearance of pure turquoise. When it comes to pure turquoise, it can actually be fairly easy to spot out if you know what you are looking for. When looking for pure turquoise, the most important characteristic of the genuine article is density. Jasper. which a popular turquoise substitute known as “African Turquoise,” is actually harder the true turquoise. A stone’s color is also a way you can determine if what you are looking at is pure and real turquoise. Blue, green, greenish-yellow are the most common forms of turquoise. White turquoise can also be found in very rare instances. As mentioned earlier, howlite by nature is white or grey. Jasper is naturally brown, green, red or yellow. Copyright © Blue Turquoise 2019. All Rights Reserved.